Simple and fast methods and workflows for getting audio from your DAW into Revoice Pro for processing and from Revoice Pro back to your DAW. TIP: Check www.synchroarts.com regularly for updates on workflows with specific DAWs. 16 to 32 bit audio samples. Multi-channel audio files: with up to 8 channels are supported in some cases. WARNING: You cannot use waveforms with different bit depths and/or different sampling rates in the same Revoice Pro Session. 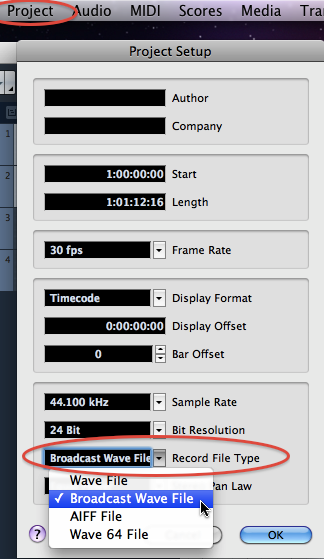 Each Revoice Pro Session's Sampling Rate and Resolution (Bit Length) are set and fixed automatically to the settings of the first audio signal imported into the session. After that, Revoice Pro will offer to resample any non-matching audio file that is imported, to match that Session's Sampling Rate and Resolution. The menus shown in this chapter are captured from the Mac OS version of Revoice Pro. However, the contents of these menus will be substantially the same for the Windows OS version (apart from file system operational differences). Any other major differences will be noted. Because Revoice Pro is a stand-alone program, we know that a critical part of your workflow is getting audio out of and back to your Digital Audio Workstation (DAW) as quickly and as easily as possible. We have tried to make the workflow with Revoice Pro meet this criteria. Transfer the processed audio back to your DAW (click here). The audio transfer methods are summarised in two tables below and work with most brands of DAWs including Pro Tools, Logic Pro, Ableton, Cubase, Nuendo, Reaper, etc. Which method(s) you chose for transferring audio will depend both on your DAW, the methods it supports, and the amount of audio you want to transfer. This chapter, although lengthy, has been organised so you should be able to follow the links below to skip to the sections related to the DAW, plug-in type, or specific operation you are interested in. Also, note, starting with Revoice Pro 2.5, besides the basic descriptions below, there are also some new DAW-specific manual chapters for describing special high-speed workflows for some DAWs. The table below - provides a Summary of the main methods, advantages, and links to sections in the manual describing these. High-speed, simplified workflow - captures, processes and returns audio to Pro Tools (like VocALign). Works with Nuendo 5 (and up) and Cubase 5 (and up). Drag and Drop audio files into Revoice Pro. Files can be existing .wav or .aiff, bounced or Exported from DAW to disk. Multiple tracks, multiple regions simultaneously. Automatic creation of file names from user-specified elements. As shown in the chart above, there are several methods for getting audio from your Digital Audio Workstation (DAW) into a Revoice Pro session. In the chart below, we identify some of the DAWs that are known to work with each method. The links take you to procedures both in this chapter or to a DAW-specific chapter in the case of newer functions. 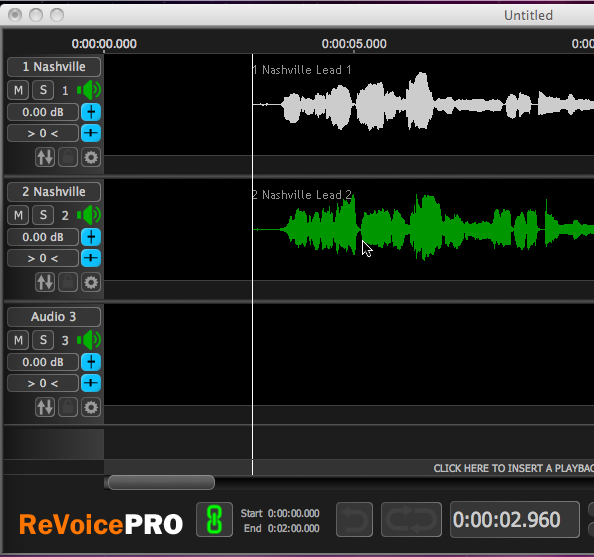 Drag and drop one or more audio files into Revoice Pro. Files can be already available, or created by bouncing or Exporting from DAW to disk. VST3 - e.g. Ableton, Cubase, Nuendo, etc. AU - e.g. Logic Pro, etc. The steps for each method are described below. This is a very efficient and fast method if the audio already exists in files. Alternatively, an approach which is less efficient than the other methods is for the user to generate multiple named files from the DAW- e.g. one for each track of audio to be processed. In this approach, the first step must be to get the audio from the DAW into Revoice Pro by either Exporting or "bouncing" the audio to be processed from the DAW to one or more audio files. These can be mono, stereo or multichannel (generally less useful) files. Once exported, the user simply selects and drags one or more audio files from the Mac or Windows file system and drops them into any Revoice Pro session track(s). TIP: If using this method, we recommend using the BWF (Broadcast Wave File format) because these files contain correct timecode information. If BWF format is not available, use .wav format. For information on exporting or bouncing audio, check the DAW's User Guides. 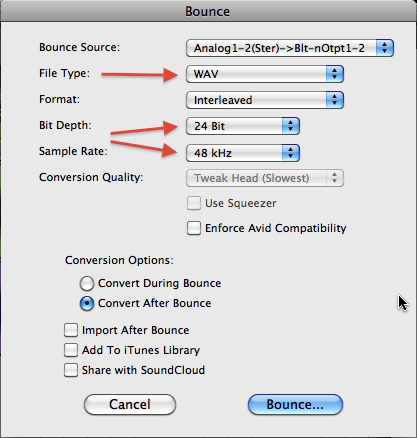 For tips on settings in some specific DAWs, click the following link Exporting and Bouncing Audio . 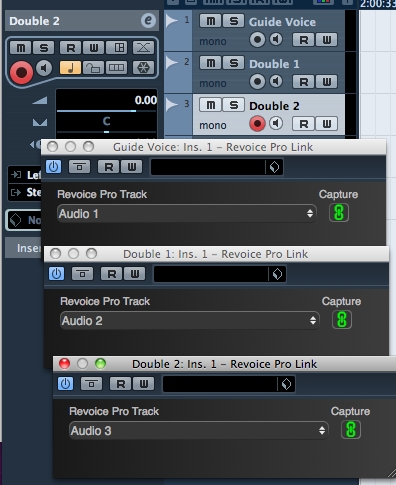 Below we show an example of dragging and dropping two files into Revoice Pro. After "drop", files with timecode will appear at the correct timecode. If the user knows that the audio files being dragged into Revoice Pro have valid and useful timecode stamps, then the Revoice Pro Auto Spot switch can be enabled to use those timecodes without requiring the user to confirm the use of the timecode. 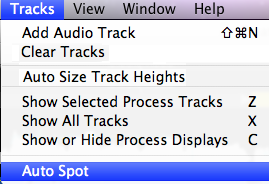 To enable Auto Spot, click Tracks in the Revoice Pro menu bar, and select Auto Spot as shown left. When this window is opened again, Auto Spot will be selected as shown right. To disable Auto Spot, click Auto Spot again. If dragged waveforms have a timecode stamp, a window (shown right) will open showing the file name and timecode start and ask if the user wants to place the waveform start at the timecode stamp or at the cursor location, which can then be dragged. Warning: .aiff files do not contain a timecode stamp. There is an option to Apply your selection to any further files during that import. If you drag more than one file, the Tracks will be populated downward from the first Track you drop into. If you drag more files than there are Tracks in Revoice Pro, enough new Tracks will automatically be created and populated by the audio files. You can also drop audio into the space below the last Track and the required number of new Tracks will be added automatically. 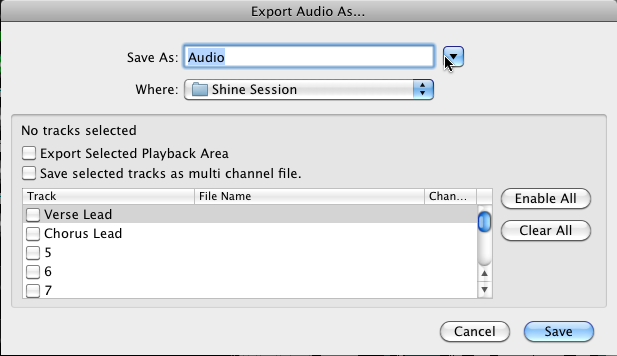 AUTO Track Naming - The first time you drag an audio file into a Track - that track will be given the file's name. This can save much time labelling Tracks. (NOTE: AAX for Pro Tools 11 only, Audio Suite for Pro Tools 10 and below). Update - there are new "Quick" versions described here. AU - for Logic Pro, Ableton Live etc. VST3 - for Cubase, Nuendo, Reaper, etc. Operation of the LINK plug-ins with other DAWs using the above plug-in standards is often possible, but depends on the full standard of the plug-in standard being implemented by the DAW manufacture. 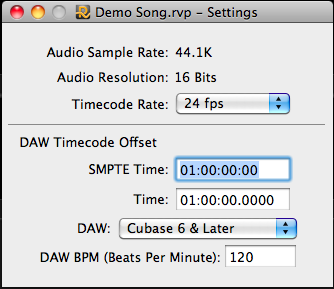 However, Revoice Link plug-in operation with other DAWs can easily and quickly be tested by the user. The Revoice Pro Link Audio Suite plug-in for Pro Tools is shown at the right. The AAX Plug-in is identical in structure and operations. These plug-ins reside in the Pro Tools Audio Suite plug-ins "Other" folder and must be selected and running in Pro Tools to appear and operate. The black panel below the header contains mainly instructions and a destination Track selector switch. In the Audio Suite "Footer" controls at the bottom, the Capture button starts the copying of audio selected in Pro Tools to Revoice Pro. Note also, this is the only Link plug-in version that can transfer audio back from Revoice Pro to a DAW (Pro Tools) apart from the new "Quick" APT and Doubler plug-ins described here. 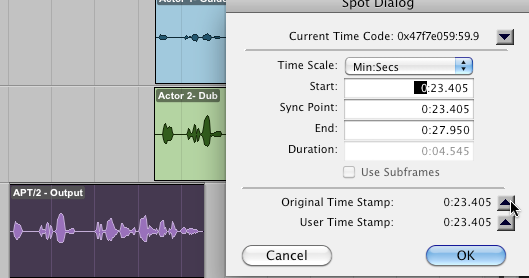 The Spot button sends the processed audio from Revoice Pro back to the user-selected tracks and correct timecode in Pro Tools. This action is described here. Before using the Audio Suite or AAX Link plug-in, make sure in Pro Tools that the Session Setup window shown below (found in the Pro Tools Setup menu under Session) is set either to 0:0:0:0 or to a desired timecode offset (a 1 hour offset is shown in the example). This Pro Tools Session Start offset will be added to the captured audio start timecode and be used as the timecode start in Revoice Pro. NOTE: If using Rewire for auditioning from Revoice Pro, the same offset must be set in Revoice Pro's Settings window in the Revoice Pro View menu. Click here for more details. The section headed Pro Tools --> Revoice Pro is used to instantly transfer selected audio from a Pro Tools track to a Revoice Pro track. Before making any transfers, once the Revoice Pro plug-in is visible, decide whether you want the individual audio regions in Pro Tools to be kept as individual regions in Revoice Pro or made into a continuous file. The Audio Suite header switches shown circled in red below will control this and will be explained further below. The transfer operation itself is simple. 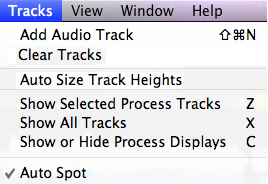 In Pro Tools, select the region(s) of audio that you want to transfer. 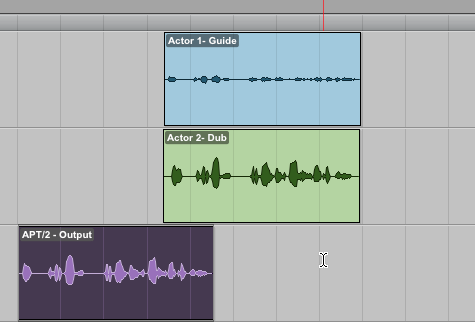 In the example shown below, two audio regions and the silence between them are selected in a Pro Tools track. The next two instructions written in the plug-in are largely self explanatory. 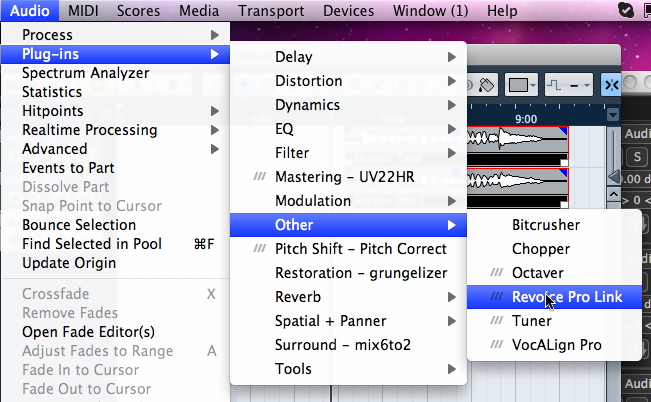 Select the destination Revoice Pro Track using the drop down selector button after "1) Revoice Pro Track". 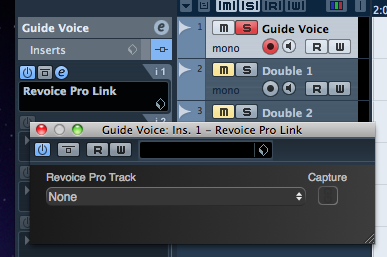 The window that appears will show the names of all the available Revoice Pro Tracks as they are labelled. 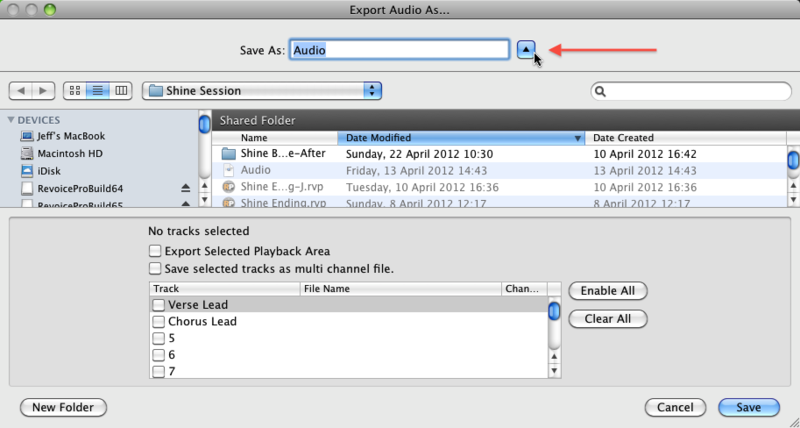 In the example below - the track in Revoice Pro labelled "Audio 4" is selected as the destination track for the audio. Press the Capture button in the Plug-in "Footer"
The selected audio will be immediately captured and transferred from Pro Tools to Revoice Pro. 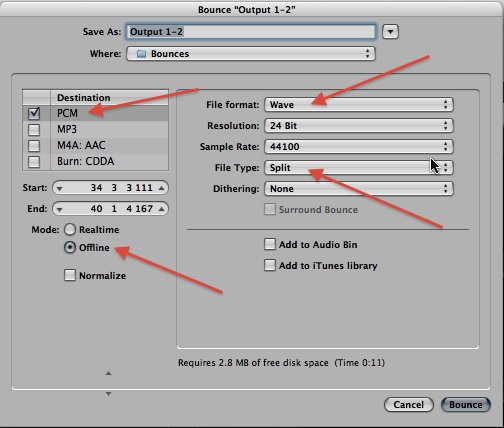 Using the example selected two waveform region os shown above, the settings in the Link's Audio Suite and AAX header will change the way that multiple audio regions are loaded into Revoice Pro - as shown below. (Other settings should not be used with multiple regions.). The "clip-by-clip" setting will maintain separated regions and create "silent" regions between waveform blocks. The Pro Tools selected input can be across multiple tracks and in the example below, we have captured two regions in each of two tracks along with the silence between. When the capture is made with either of the header settings shown below, if "multi-input mode" is selected the Pro Tools tracks are combined into a stereo waveform as shown below to the right. Again, if "clip-by-clip" is used instead of "entire selection", the results will be split into multiple regions as above for the mono signal example. Click here to read how to use the Audio Suite and AAX Link Plug-in to send audio from Revoice Pro back to Pro Tools. In this section, we will show how to transfer audio from Logic Pro to Revoice Pro, using the Revoice Pro Link AU plug-in. Note: These techniques should also work with other DAWs that use AU plug-ins such as Ableton Live, etc. but check by trying it first. Or check on www.SynchroArts.com for a compatibility chart. TIP: It is important to understand that a Link plug-in can be inserted into each track, and there is no limit to how many Link plug-ins can be inserted in the DAW. This means one or more tracks can be transferred at the same time. Transferring more tracks at the same time can greatly speed up your workflow. Because of the way AU plug-ins work, the Link transfer operates like a "real-time" bounce to disk and therefore will take as long as the selected audio plays. This might be efficient, if transferring several tracks to Revoice Pro at the same time. An alternative to consider (particularly with longer files) is using a faster-than-real-time export or "bounce" of audio files containing the desired tracks, and then dragging these files into Revoice Pro, as described previously here. will create a named audio file from the selected region that can be dragged into a track in Revoice Pro. 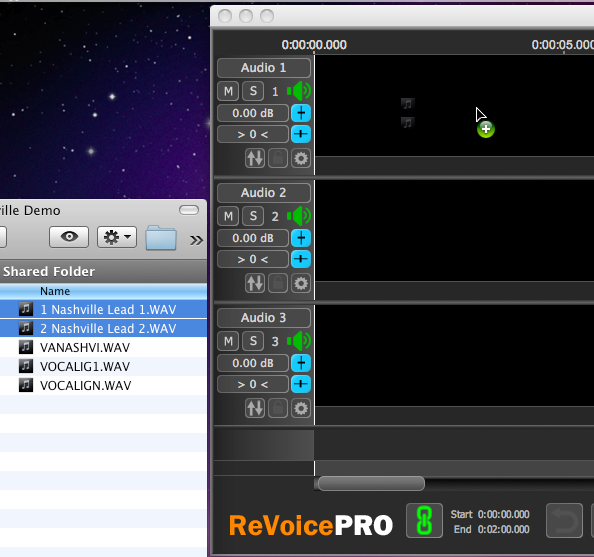 This may be much faster than using the Link plug-in and the exported file name will become the Revoice Pro Region name . Make sure the Link switch is ON (as shown right) in the Revoice Pro Session window where you want to receive the audio, because this tells the Link plug-ins where to send it. We recommend that you name the Revoice Pro Session tracks to names that will identify the audio received in each track. Make sure you check in the Revoice Pro View, Settings window (shown right), that Revoice Pro's DAW Timecode Offset / SMPTE Time is set to the same Offset as the Logic Pro Project Synchronization setting. 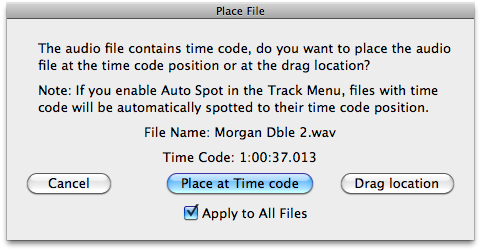 Logic normally sets this by default to 1 hour, as we also do in Revoice Pro. The Time display will show the actual corresponding running time - based on the Timecode Rate. 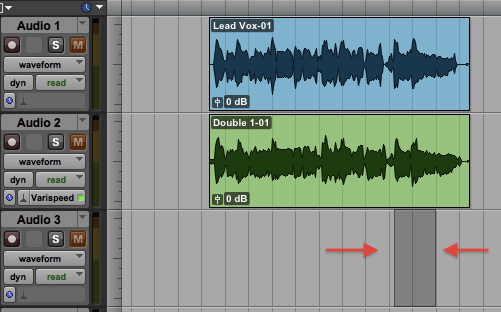 In Logic Pro, insert the Revoice Pro Link plug ins as an Insert on each track you want to transfer audio from. Access the Link plug-in from the Audio menu as shown below. 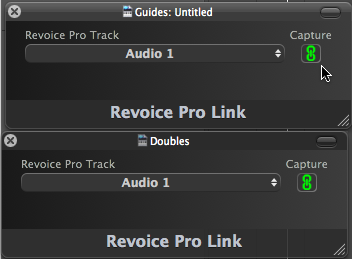 Once the Revoice Pro Link plug-in is set as an Insert in Logic Pro, it will be shown as below and be labelled with the name of the Logic Pro Track, which in this example is called "Guides". In the picture above, the AU Plug-in header is presented. However, clicking the top right hand button will remove the header and make the Plug-in more compact, as shown below showing only the essential controls. 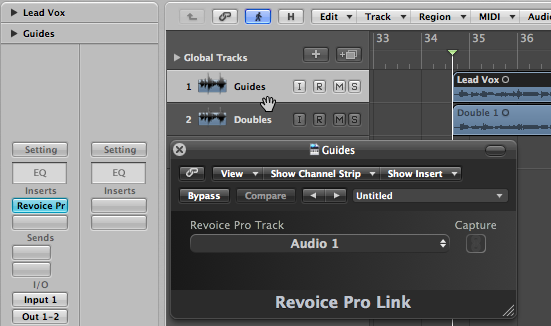 The Revoice Pro destination track is selected in each Link plug-in by clicking the drop down bar, which will reveal a list of the track names in Revoice Pro. Select the required track. In the example above and below, "Audio 1" is selected. Repeat the insertion steps (1 and 2) and Destination track selection step (3) for every Logic Pro track that contains audio to transfer. Click on the Capture Enable switch under the label "Capture" to make it turn ON (shown in green at right). ALL Capture switches in visible Link modules can be toggled ON or OFF by holding down the SHIFT key and clicking any of the modules' Capture Enable switches. Below we show two Link modules with Capture enabled. Line up the Logic Pro Playhead to the start of the audio you wish to transfer and start the Logic Pro playback. All of the tracks that have the Capture enabled will begin transferring the captured audio to Revoice Pro tracks. Further information on Link modules. When capture stops, all the Capture switches will automatically toggle off so you don't accidentally start a capture again. But, if you do, Revoice Pro will show overlapping audio via a Warning indicator at the right of the screen and a yellow line under the area of overlapping audio. Lastly, the area under the Link's Track selector is where any Error Messages will appear (in Red), such as below, which occurs when you don't have any Revoice Pro Session window's Link switch On. This ends the discussion on the AU Link plug-in transfer with Logic Pro (and similar DAWS using AU plug-ins) to Revoice Pro. You would next Process the captured audio. Click here for instructions on sending the processed audio from Revoice Pro back to Logic Pro or other DAW. In this section, we will show how easy it is to transfer audio from Cubase to Revoice Pro, using the Revoice Pro Link VST3 plug-in. Note: These techniques should also work with other DAWs that use VST3 plug-ins such as Nuendo, Reaper, etc. but check by trying it first. Or check on www.SynchroArts.com for a compatibility chart. IMPORTANT UPDATES: If using Nuendo or Cubase versions 5 and up, we recommend using the newest Copy and Paste or Drag and Drop operations described in this Manul here and also regularly updated on our website here. ALTERNATIVE: Because of the way VST3 plug-ins work, this transfer operates like a "real-time" bounce to disk and therefore will take as long as the selected audio plays. 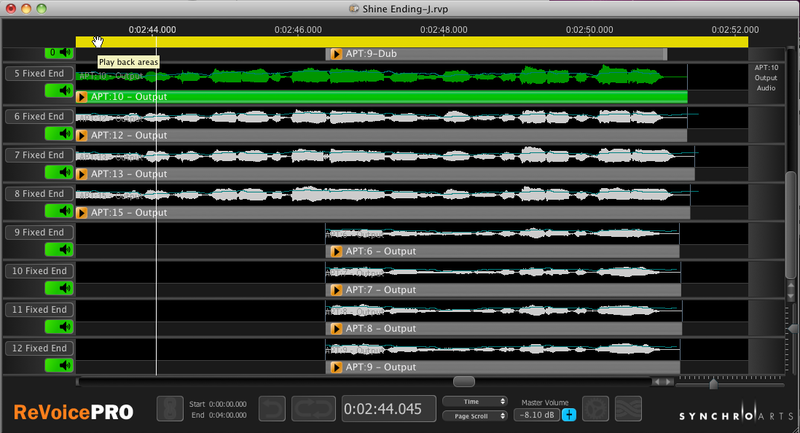 This might be efficient, if transferring several tracks to Revoice Pro at the same time. An alternative to consider is using a faster-than-real-time bounce to disk audio files of the desired tracks, and then dragging these files into Revoice Pro, as described previously here. 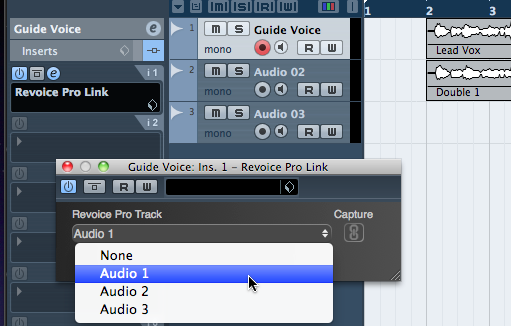 In Cubase, insert the Revoice Pro Link plug ins as an Insert on each track you want to transfer audio from. Access the Link plug-in from the Audio menu as shown below. Once the Link plug-in is set as an Insert, it will be shown as below and take on the name of the Cubase Track. In the example, it is called "Guide Voice". 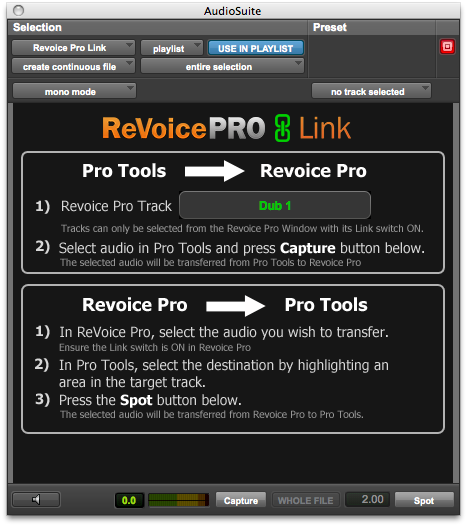 The Revoice Pro destination track is selected in each Link plug-in by clicking the drop down bar which will reveal a list of the track names in Revoice Pro. Select the required track. 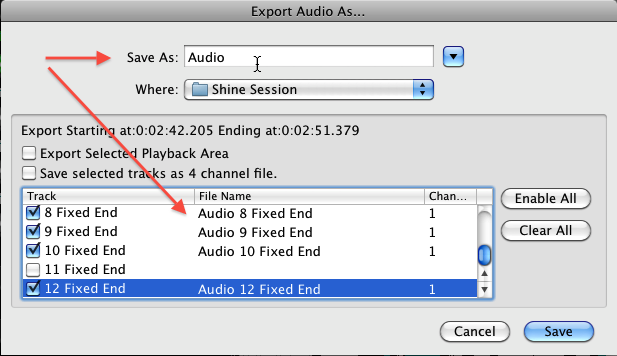 In the example below, "Audio 1" is selected. Repeat the insertion steps (1 and 2) and Destination track select steps (3) for every Cubase track that has audio to transfer. ALL visible Link modules can be toggled ON or OFF by holding down the SHIFT key and clicking any of the modules Capture Enable switches. Below we show three Link modules all with Capture enabled. Line up the Cubase Playhead to the start of the audio you wish to transfer and start the Cubase playback. All of the tracks that have the Capture enabled will begin transferring the captured audio to Revoice Pro tracks. When all of the audio to be captured has played, stop the Cubase playback, the capture operation will stop and the captured audio will appear in the selected tracks in Revoice Pro. All the Capture switches will automatically toggle off so you don't accidentally start a capture again. Lastly, the area under the Link's Track selector is where any Error Messages will appear (in Red), such as when you don't have any Revoice Pro Session window's Link switch On. This ends the discussion on the VST3 Link plug-in transfer from Cubase (and similar DAWS using VST3 plug-ins) to Revoice Pro. You would next Process the audio. Click here for instructions on sending processed audio from Revoice Pro back to Cubase or other DAW. 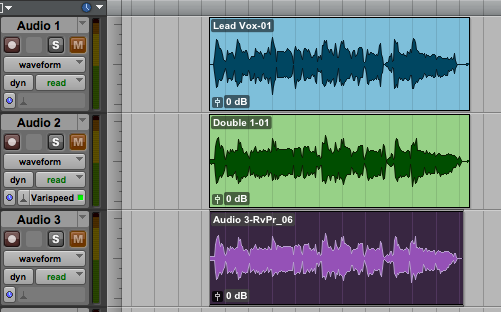 Once the audio is loaded in Revoice Pro, the waveforms can be processed (with APT or Doubler processes) and/or Edited. In Revoice Pro, you will normally send the processed audio into Output Tracks. You will often need to create these output tracks and we recommend that you name these tracks with “Out” (or something similar) in the name. (e.g. "Out-Lead 1" or "Out-Actor 1"
Do your Revoice Pro processing into these Output tracks. You then will need to get the transfer the Processed Output audio back to your DAW. This is described in the next workflow section. There are three simple methods for getting audio out of the selected Revoice Pro Session window and back to your DAW. Drag and Drop individual processed regions from Revoice Pro directly into your DAW tracks. 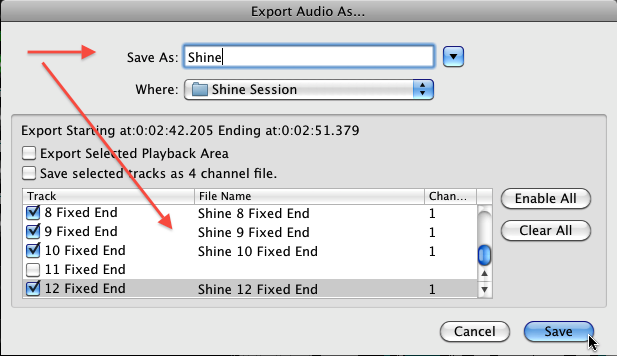 Export one or more tracks of processed Revoice Pro Audio to files and drag these into your DAW. If using Pro Tools, you can use the Revoice Pro Link Audio Suite plug-in or the "Quick" APT and Doubler plug-ins described here. NOTE: After using method 1 and 2, you will probably need to use a DAW command to shift the audio to the right start time. Instructions for each of these methods follows. 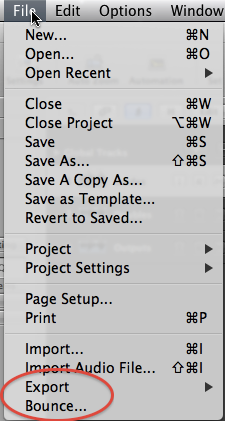 Keeping the LEFT mouse button held down, drag the document icon into a track in your DAW. Release the LEFT mouse button. The waveform will go to a position near where you "dropped" it, but not necessarily to the correct start timecode. If that's the case, the next step will move it to the correct start timecode. We list examples of the specific command below for a few DAWs. 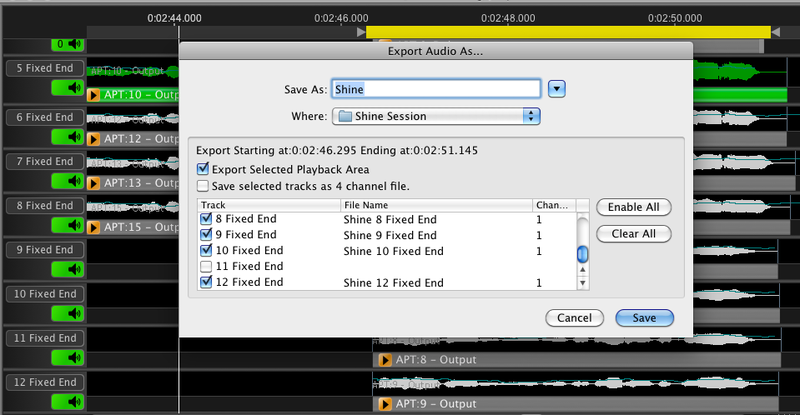 Other Editors Look for similar commands to "Spot" or "move audio start to timecode stamp". This method is another approach to Step 3 in the Example Workflow and provides extremely fast and efficient transfers of all or selected portions of Revoice Pro's Processed audio tracks. Multiple exported tracks can be dragged together to the DAW at one time. Note that the names of the Files that will be created are shown in the "File Name" column. These have been automatically named by combining the Track Name and the default Save As: prefix name "Audio". If we select the option Export Selected Playback Area, as shown below, we can see that the time range being output is now modified to only include the audio within the Playback Range (defined by the yellow bar at the top of the Session). Lastly, if we select the option "Save selected tracks as a [N] channel file", where N will be the total of the number of channels in all the selected files and one file will be saved. 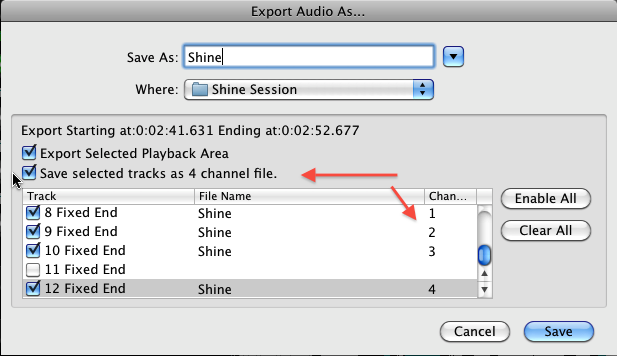 In the example below - there are 4 mono tracks, so a 4 Channel file will be saved. If there were 4 stereo tracks, an 8 channel file would be saved. Note that not all DAWs would be able to use such multi-channel files. This completes the operation for Exporting audio in multiple selected tracks from Revoice Pro to your DAW. 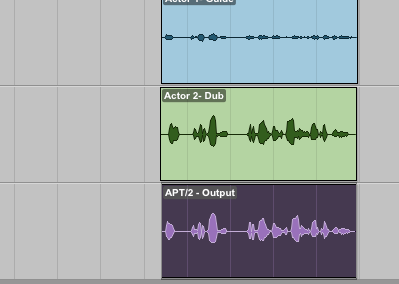 The Revoice Pro Link Audio Suite (shown right), can instantly transfer and "Spot" a single audio region from Revoice Pro to the correct timecode in a designated Pro Tools track. NOTE: The AAX version operation and appearance is identical. This is an extremely quick method for transferring processed regions individually. TIP: We recommend that the Pro Tools Audio Suite or AAX Header controls (at the top of the Link plug-in window) should be set mainly according to the image below. The lower section of the Link plug-in shown above, in the section displaying Revoice Pro -> Pro Tools, provides the three simple steps which we explain further below. 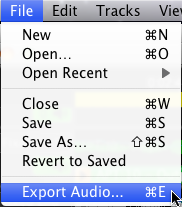 1) In Revoice Pro, select the audio you wish to transfer. NOTE: Audio may already be selected automatically after processing - so you often do not need to do this step. 2) In Pro Tools, select the destination by highlighting an area in the target track. TIP: If the timecode position of the audio spotted in Pro Tools is wrong, make sure the Sample Rate settings for the Pro Tools Session and the Revoice Pro Session are the same. are given below, but the issues raised will apply to all DAWs. A Bounce setup window will appear similar to that shown below. Make sure the File Type is set to WAV. If the Revoice Pro Session already contains audio, make sure that Bit Depth and Sample Rates are the same as in the current Revoice Pro Session. Drag bounced files into Revoice Pro. In Cubase, Select Project menu and Project Setup. As shown in Cubase Project Setup window, make sure the Project Setup "Record File Type" is set to Broadcast Wave File as shown in image below left. In Cubase, select the audio region(s) to Bounce (can include across multiple tracks). 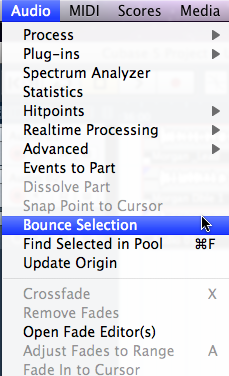 Select Cubase Audio menu and choose Bounce Selection as shown below right. The user should be familiar with the various options and settings required. Additional options such as Mode: Offline (instead of "Realtime") makes the generation of the audio files be done in significantly less than real time .